Ok so this post may not make me a popular person – especially in the cycling community but I must vent! Here’s a thank you to the Welsh Government for wasting money on cycle paths. Why spend so much creating them when damn cyclists don’t use them!!?!! Firstly let me say that I do admire cyclists as it is a healthy thing to do. And I also admire the Welsh Government for creating the cycle paths as it’s made the roads safer for both motorists and cyclists. What I cannot get my head around is those cyclists who don’t use the cycle path and end up in the road. They clog up the road and cause congestion. I mean I’m not allowed to use the cycle path with my car am I? In certain circumstances I can see a reason not to use the path for example if the path is not adjacent to the road. But if the cycle path is adjacent to the main road will you please use it?! And it’s the safety factor that I don’t understand. Those cycle paths are there to make it safer for the cyclists to enjoy their hobby. 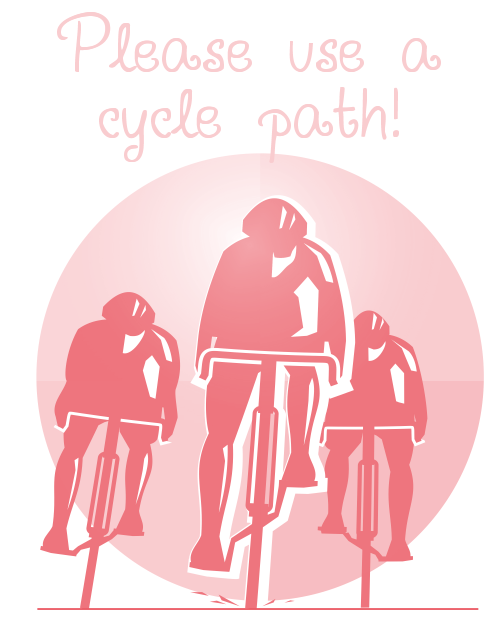 I’ve seen so many cyclists not using the cycle path and cars pass by so close to them. Please please use them! I don’t understand why anyone would voluntarily cycle on the road. The reason I don’t cycle is because there aren’t guaranteed cycle paths everywhere and I’m terrified of the road! See that’s exactly it! Cycling on the road in fear of lorries, buses and mad cars just does not appeal to me! However on the cycle path next to the road I don’t mind! It is frustrating! I just don’t understand why not use cycle paths! totally understand!! How annoying! I’m VERY excited to start riding a bike over here in Munich but cyclists pretty much rule the place AND they have the right infrastructure to do it. C’mon Cyclists in Wales!! Oh I’d love to be able to ride a bike to work but it’s just way too far! When kiddiwinks are older we will get bikes. A European trip to get onto some proper cycling infrastructure would be fab!